2016 - what a year it was! A great year for some, an 'annus horribilis' for others. But everyone would agree that it ended with more deaths than we cared to read about. A timely reminder that we should pay more attention to our health in the coming new year and beyond. We would rather read about birthdays and wedding anniversaries than obituaries. 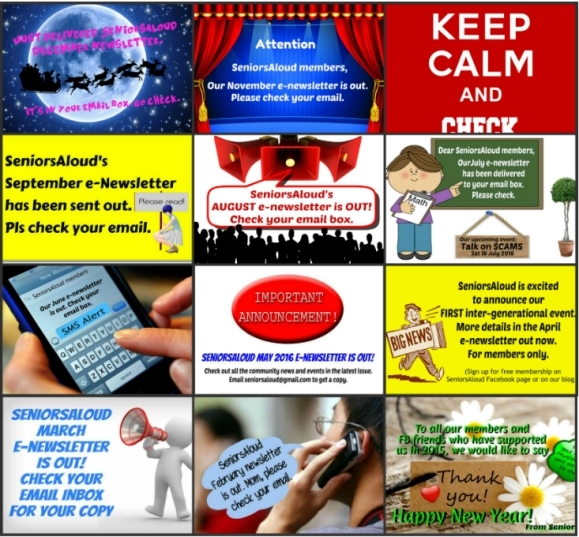 For SeniorsAloud, 2016 was another eventful year, with further growth in membership, more events organized and wider reach on social media. 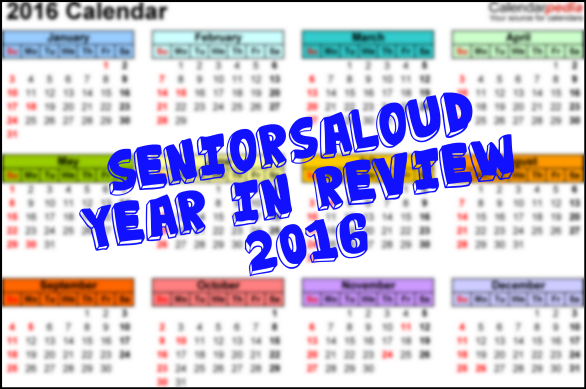 Here's a look back at the year that was for SeniorsAloud. 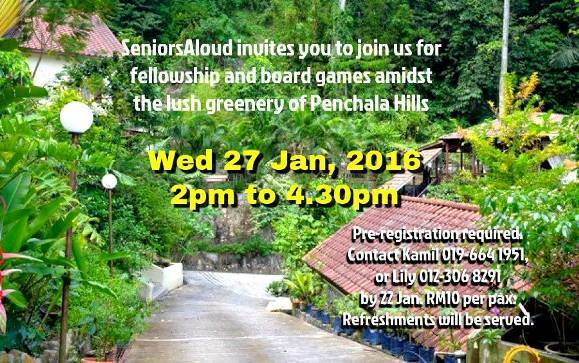 We started the year with a get-together for members at Penchala Hills. It was a pleasant evening spent chatting and playing Math Magic, an engrossing board game created by Jimmy Yeoh. 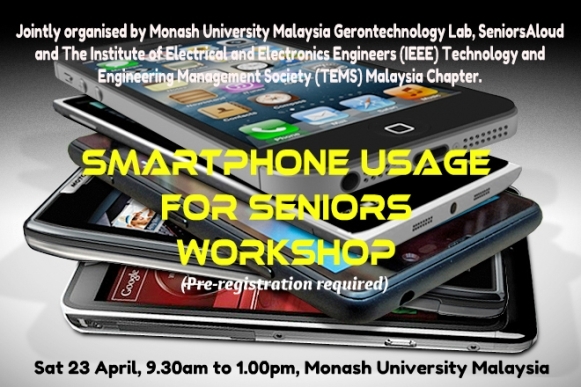 In April, our members attended a free workshop organised by IEEE, TEMS, Gerontechnology Lab of Monash University and SeniorsAloud to learn more about the features and uses of smartphones. It was followed by a very interesting and informative tour of the lab, the first in Malaysia. Thank you, Associate Prof Dr Teh Pei Lee and your team of very knowledgeable facilitators. 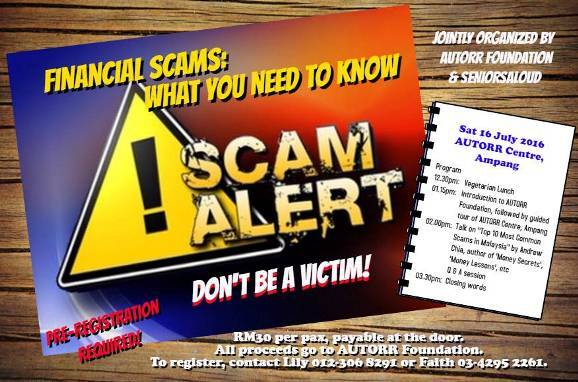 SeniorsAloud and AUTORR Foundation co-organized a workshop in July to raise awareness of the prevalence of scams targeting seniors. Speaker Andrew Chia shared his list of the top 10 scams that we should be on the alert for. 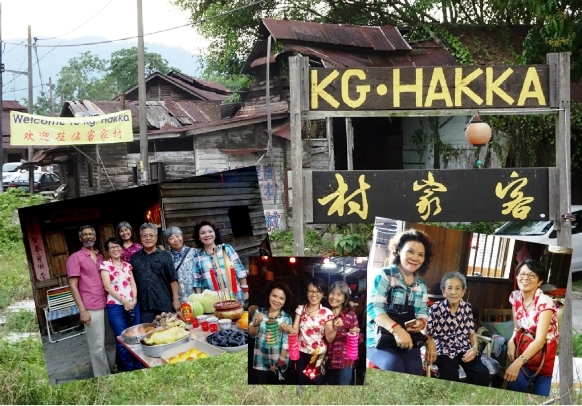 Our third visit to Kg Hakka was to join Victor Chin and Rakan Mantin group in celebrating the Mid-Autumn Festival in September. We paid Grandma Kong a visit and watched as she offered prayers outside her house. It was a throwback to the old days when we held feasts, ate mooncakes and carried lanterns in the parade around the kampung. 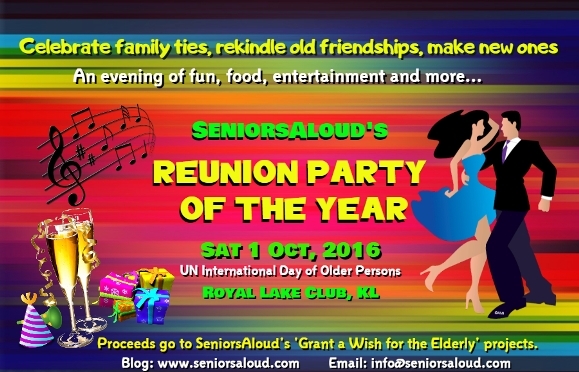 SeniorsAloud held its 3rd annual fund-raising 'Reunion Party' dinner and dance on 1 October which was also United Nations International Day of Older Persons. As in previous years, we had an excellent turnout. All tables were taken. Thanks to generous sponsors and donors, we were able to invite 19 guests from several NGOs, and give away more than 60 attractive prizes to lucky draw winners. While SeniorsAloud continues to remain non-political and non-religious, we do support human rights and calls for justice and transparency. 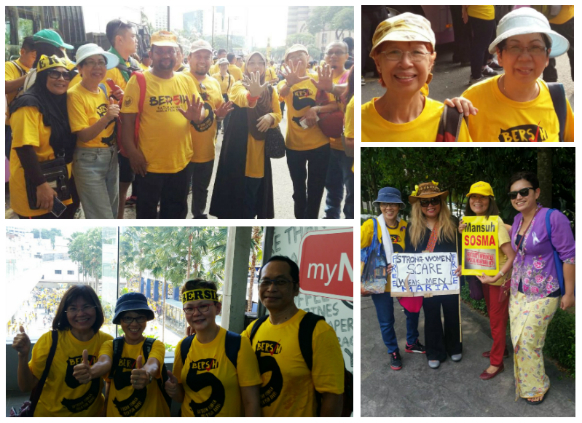 For these reasons we participated in Bersih5 on 19 Nov as well as 'Walk 4 Maria' on 23 Nov. We are glad to have added our voice for these causes. 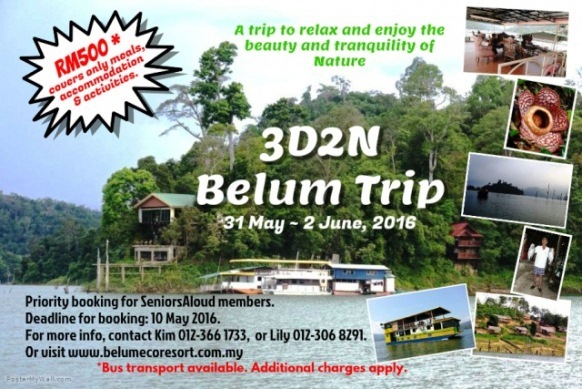 Thanks to funds raised from our annual dinners, SeniorsAloud is able to help senior citizens and the elderly in need under our 'Grant a Wish for the Elderly' project. In January we covered the cost of cataract surgery for Mr Liow Cheng Loon, 69. As a red IC holder, he was not eligible for govt welfare aid. His plight was brought to us by Justin Cheah of Kechara Soup Kitchen. The surgery was carried out in January. We are glad that Mr Liew is now enjoying clear vision. We were happy to oblige when Keats Makandu, founder of Mums Sew With Love (MSWL) approached us for help to purchase an electric sewing machine so that the single mothers could sew more and earn more to support their children. On 12 May, SeniorsAloud team members Choke Ling, Kim and Lily were present at MSWL to hand over the machine. 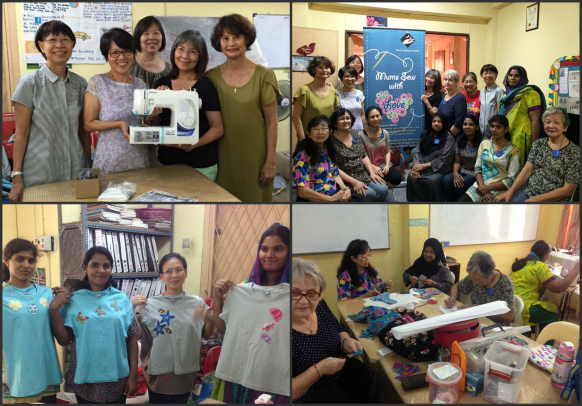 We hope it will make a difference and enable the moms to cope with the increase in orders for their high quality home-sewn products. It was our pleasure to invite five of the single mothers out to celebrate Mothers Day with a concert and a buffet at VSQ @ PJ City Centre. It was a real treat for them and for us too to see their smiling faces. 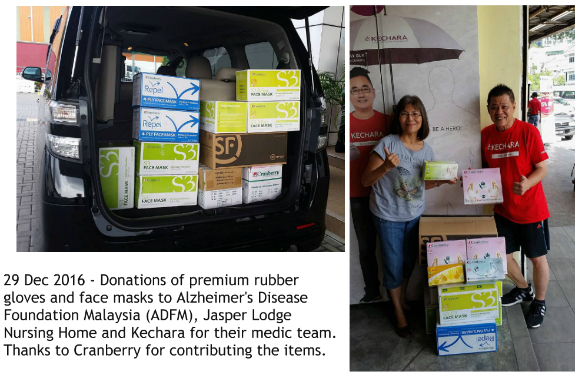 We ended the year with distribution of rubber gloves and face masks to two NGOs and a nursing home. The items were donated by Cranberry. 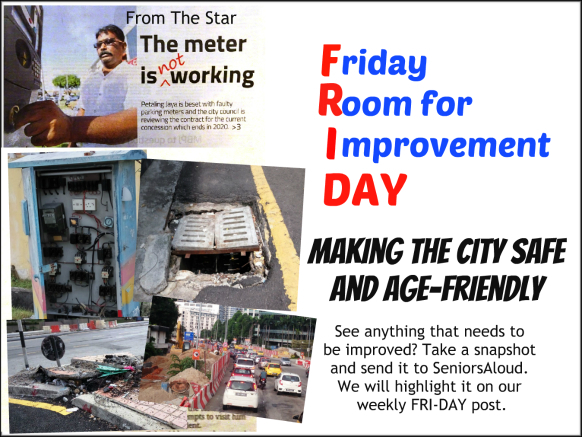 Do contact us if you know of any NGOs or old folks homes that will welcome these items. 11 March marked the launch of our Friday Room for Improvement Day. Smartphones have made it so easy for us to snap photos of anything we see around us that should be improved. We can all be vigilant and help make our city clean and safe for all, regardless of age. 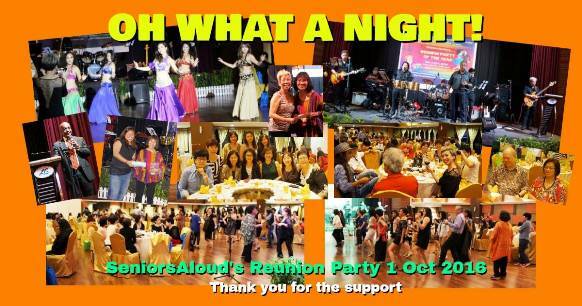 Send the photos to SeniorsAloud for posting on our FB page. Please provide info of the date and place where the photos were taken. We have seen corrective action taken by the relevant authorities in response to some of the hazards that we have highlighted. 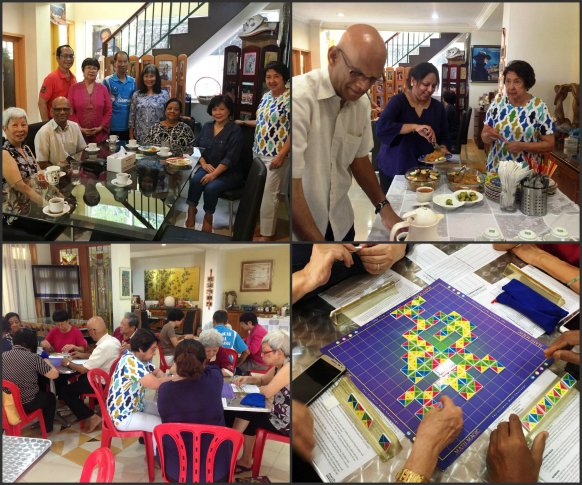 We look forward to doing more in 2017 to promote active ageing, lifelong learning and reach out to more seniors through our blog and FB page. Do help us to spread the word. Finally we would like to thank all our members, FB friends and sponsors who have supported us through another successful year. THANK YOU, THANK YOU, THANK YOU! 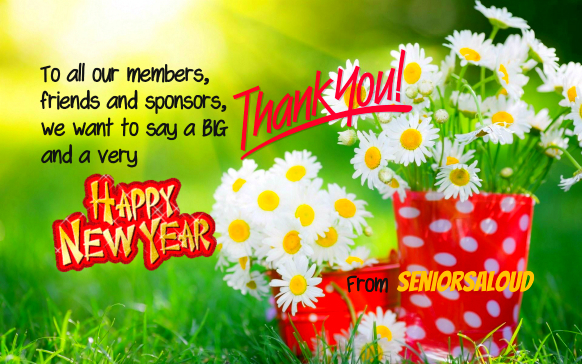 And deepest appreciation to SeniorsAloud team members who have been most generous with their time and energy in helping to organize the many events and activities held throughout 2016. Here's to a happy, healthy NEW YOU (and NEW US) in 2017!